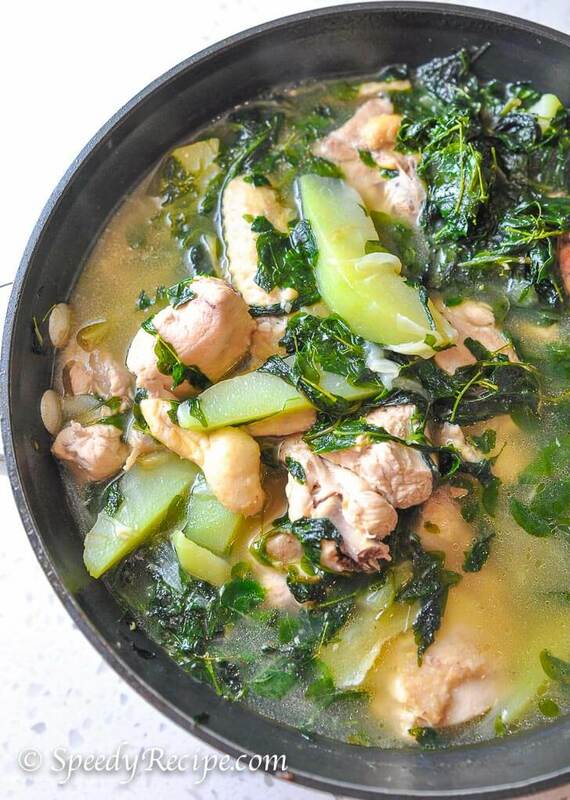 Chicken Tinola Soup is a type of Filipino chicken soup wherein chicken slices are cooked in ginger broth until tender, while slices of green papaya (or chayote) and malunggay leaves are added towards the end. This clear soup dish is perfect during rainy days and cold weather because the ginger broth and chicken can provide a comforting effect and it can also help keep you warm and cozy. 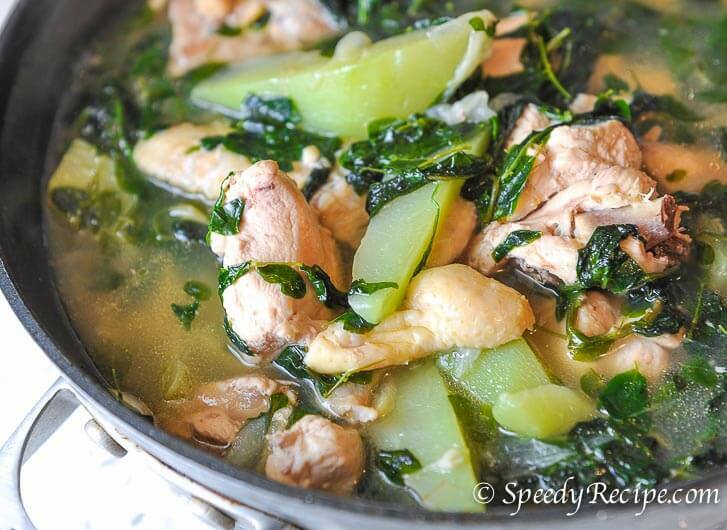 This chicken tinola recipe makes use of rice washing. When cooking white rice, it will need to be washed (or rinsed) first. Washing the rice means placing it in a bowl or in cooking pot along with a cup or two of water. Move it around using one hand until the water starts to turn white. The white water is what is called the “rice washing”. Chicken broth is also an important ingredient because it adds flavor to the soup. Chicken broth can be omitted, but you will have to cook the chicken in low heat for several hours in order to extract the flavor that you need. The broth saves you time and effort too. Malunggay leaves are native to tropical and warm places. It might not be always available in all locations. In fact, these vegetable is sold frozed in Asian stores on some states. You may use Spinach as an alternative ingredient. feel free to use any long green chili that you have access to.Korean hot pepper and Jalapeno are good alternatives. Chicken Tinola is eaten with rice on the side. It is best when you have a small bowl or saucer of fish sauce with chili on the side. The fish sauce is drizzled over the chicken slices before eating it. Try this Chicken Tinola Soup Recipe. Cheers! This is a recipe for Filipino chicken soup known as Tinola. It has chopped chicken pieces, malunggay, and green papaya. Saute garlic until light brown. Add onion and ginger. Continue to saute until the onion gets soft. Add the chicken. Cook until light to medium brown. Pour-in the chicken broth and rice washing. Let boil. Cover and cook in low to medium heat for 35 to 40 minutes. Add the chayote or green papaya and long green chili (if desired). Stir and cook for 5 to 7 minutes. Add the malunggay and hot pepper leaves. Stir and cook for 2 minutes. Pour-in the fish sauce. Stir. Turn the heat to off and serve.